This delicious barley breakfast bowl recipe from Kate Doran is naturally dairy-free, and vegan if you swap the honey for maple syrup or agave nectar. 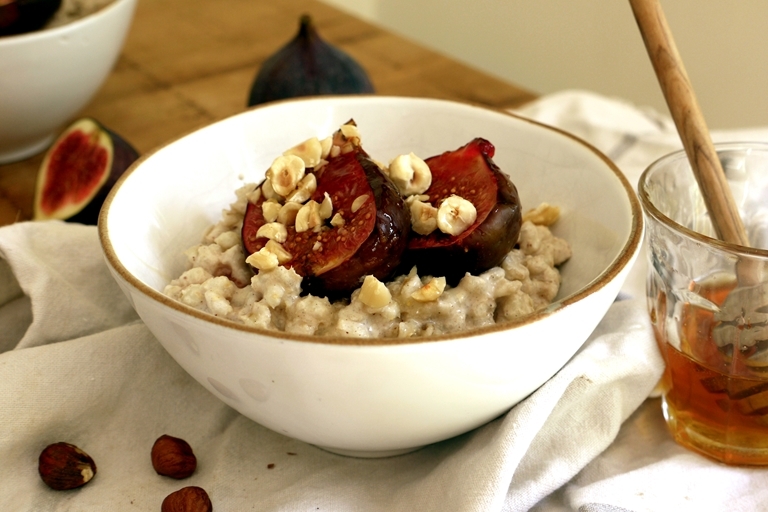 Made with a homemade hazelnut milk, this breakfast will give you the perfect start of the day, and holds plenty of sweetness thanks to beautifully roasted figs. Pearl barley is high in fibre with a natural nutty sweetness that works wonderfully with the homemade hazelnut milk. It isn’t a quick cooking grain, so you might want to start these breakfast bowls the night before, especially as the hazelnuts require soaking. The cooked barley will keep in the fridge for several days, making this the perfect healthy breakfast to meal prep for the working week. Leftover pulp from making the hazelnut milk can be added to smoothies, baked oatmeal or dried and used as flour in cookies and tray bakes.